Twix bars used to be my favorite, so naturally I had to come up with a recipe for vegan twix bars. These homemade twix bars are not only vegan, but they are also gluten free. 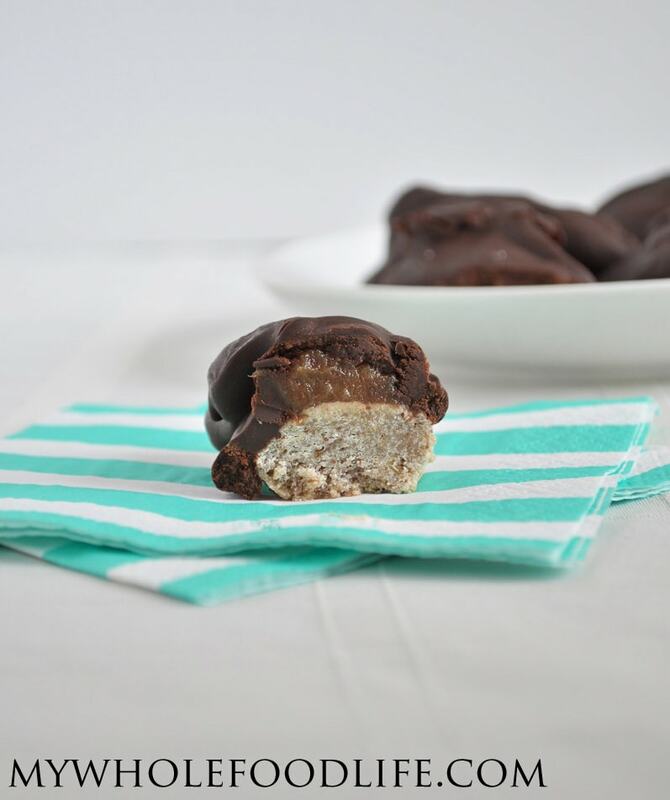 These vegan twix bars only contain 9 ingredients and are super easy to make! I used chocolate chips for the coating, but you could also use my 3 ingredient chocolate recipe. I have to be honest. These don’t taste exactly like twix bars, but they are still very delicious. I had a hard time keeping my hands off them! I hope you enjoy them as well. A homemade version of the popular candy bar! In a bowl , mix the dry ingredients for the cookies. Stick the bowl of dough in the fridge for 20 minutes. This allows it to firm up slightly so you can form it into bars. Once the dough is a little firm, form it into thin bars and place on a lined baking sheet . The dough may still be a bit sticky. Mine were about 3 inches long. While the cookies are baking, you can make the caramel. Drain the dates and dump them into a small blender or food processor . I used the Twister jar on my Blendtec and it was perfect. Blend the dates into a caramel. You may need to add 1-2 tablespoons of water to get the consistency right. Once the cookies are cooled, spread a caramel layer onto the tops of each. Place the cookies on a parchment lined plate and stick in the fridge while you make the chocolate coating. To make the chocolate use a double boiler. Fill a pot with water, bring it to a boil, and place a glass bowl on top of the pot. Put the chocolate chips and almond milk in the glass bowl. This will allow the chocolate to gently melt. Once the chocolate has melted, spoon it on top of the bars. Place the covered bars back in the fridge to firm up. Should take an hour or two. You could probably place them in the freezer to speed up the process. Keep these bars in the fridge or freezer. Enjoy! Oh my god, my brother and I used to devour Twix bars as kids! These look so good! I love creating healthy versions of old favorites. I just posted a recipe today for Paleo Chocolate Chip Cookies that remind me of Tollhouse's recipe (my childhood favorite). I might have to make some of your Twix bars next! Well now I know what I'm making this weekend! How many did the recipe make? What could I substitute for coconut oil? I know my daughter would love these if there is something I could use instead. You can use another oil if you like. Maybe grapeseed? OMG, I love Twix bars. I shared on FB since I know a LOT of my friends love them too. Melissa, I can't wait to make these! Thank you for sharing. You are so welcome Laura! I hope you enjoy them! These sound great! I notice that maple syrup is included in a lot of your recipes. Is it used in place of something else? Thanks! You can use honey if you like. Melissa, these were great. Have been picked as the best so far by the family. My biscuit base was quite dry and nearly solid when I took it out of the fridge but it turned out fine. The kids believe that it's real caramel! And the Husband can't belive that it's not caramel. Another success story.